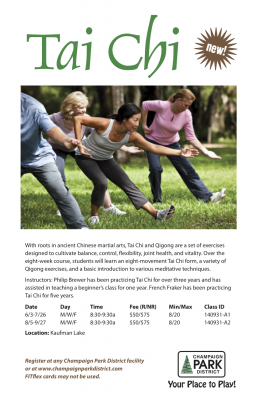 We’ll learn some moving Qigong exercises, an 8-movement form, and provide an introduction to meditation. The class is appropriate for beginners, although other students are also welcome. Register at the park district website or at any park district office. Update 3 June 2013: The class has started, but the Park District is keeping registration open for another week or two, hoping to pick up another student or two.